There is nothing like watching a game of baseball to lift your spirits and unleash that inner kid as you get caught up in the excitement of the crowd. The Durham Bulls Athletic Park, known as DBAP (pronounced D-Bap), is home to the Durham Bulls, Triple-A affiliates of the Tampa Bay Rays, in the International League. This multi-million dollar ballpark, located near the American Tobacco campus in downtown Durham, opened in 1995. It has many characteristics of old time parks plus modern comforts such as extra wide seats with seat backs and extra legroom. Ninety-five percent of the seats also have cup holders. Seating was expanded to 10,000-seat capacity for the 1998 season, and in 2002, a new playground area was added to the park. About a mile north, on the corner of Corporation and Morris streets, is the old Durham Athletic Park. 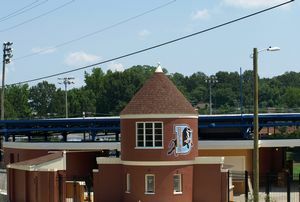 Besides being home to the Durham team from 1926 – 1994 (the city did not have a baseball team from 1972 – 1980), it is also one of the site locations for the 1988 film, BULL DURHAM. The popularity of the film, starring Kevin Costner, Susan Sarandon, and Tim Robbins, made the Durham Bulls famous. The film team's snorting bull, used in the movie, was originally meant to be a prop, but the Durham Bulls kept the prop (it now hangs on the concourse level of DBAP) and had another bull made to stand above DBAP’s Blue Monster. The Blue Monster is the 32-foot high wall, standing in left field, 305 feet from home plate. It was made to resemble Fenway Park's Green Monster. Like Fenway, the Blue Monster has a manual scoreboard. 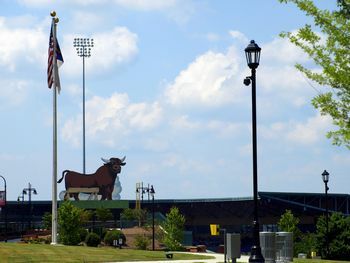 The Durham Bulls Athletic Park is located at 409 Blackwell Street, Durham, easy to reach off the Durham Freeway. It is wheelchair accessible and has accessible parking available. For more info: DBAP phone: 919.956.BULL (2855). Old Bulls Stadium is still in use.